I was surprised a couple weeks ago when I received a letter from Hilton offering me Gold Status (second tier elite) until February 2013. I have never stayed in a Hilton in my life – I was granted this status because of some sort of arrangement between United and Hilton. I had a trip planned shortly after I received this notification, so I decided to switch hotels from the Courtyard Marriott Toronto (lower class Marriott) to the Hilton (not top of the line, but higher class in the Hilton chain). I figured, I’d give it a try, and if it sucked, I’d never return. I actually kept my Marriott reservation for 2 of the three days, just in case I hated this hotel. Before the trip, I began following Hilton and Hilton Toronto on twitter and corresponding a bit with them — they were quite responsive. Hilton allows you to check in online early (neither Marriott nor Starwood allows for this). I like the idea, and you get to choose which room you want. 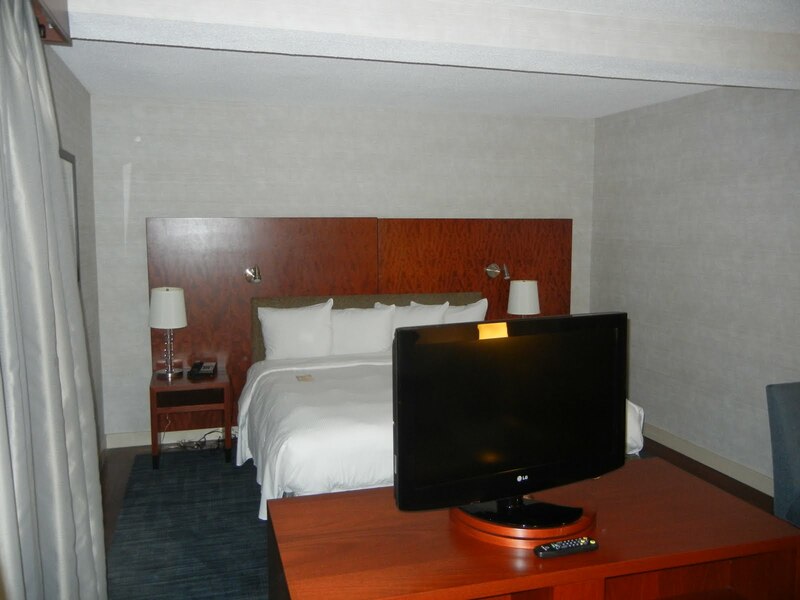 I opted for the Junior King Suite on the 27th floor, away from the elevators and the ice machine. 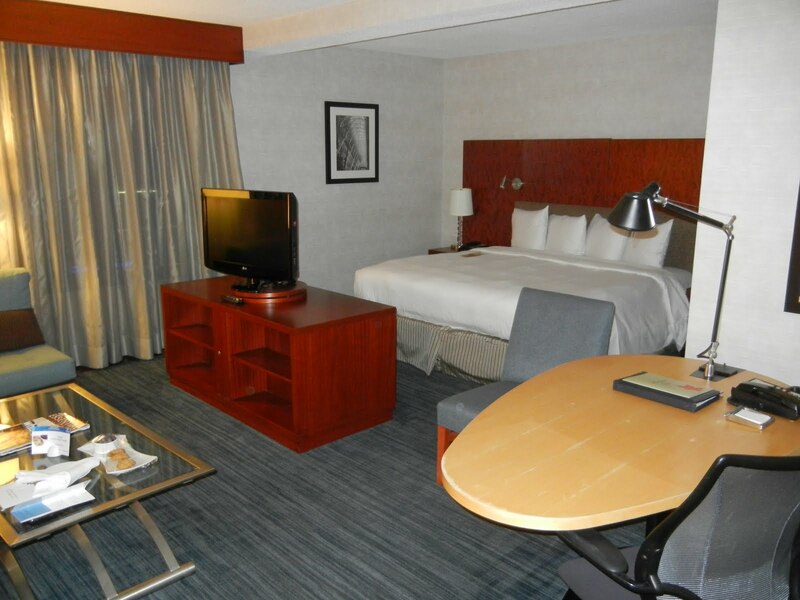 I tweeted HiltonToronto and told them I loved the online check in option and asked if I had picked a good room. In just a few moments their Social Media folks had contacted me and said they had changed my room to a lower room because my selection wasn’t the best. Good to know. I arrive around 2200 and went to the Gold Elite Check-in Counter. 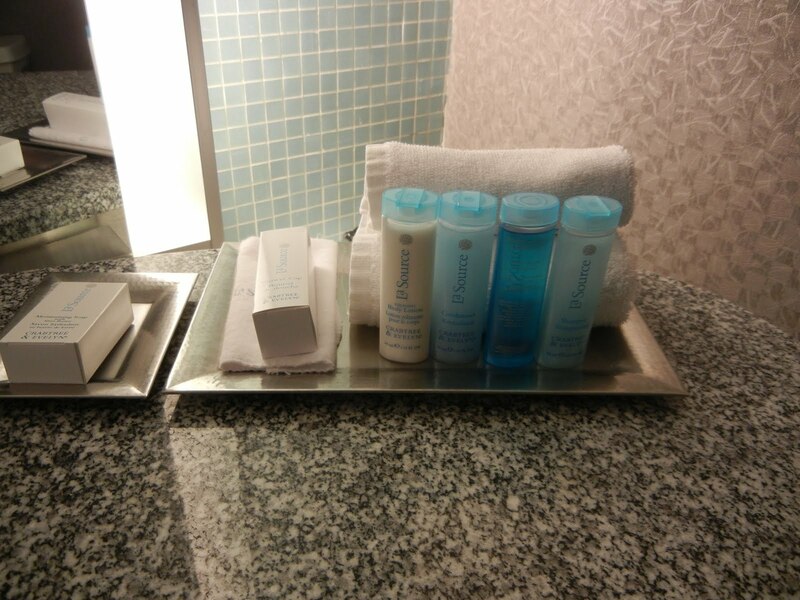 Check-in was easy and the front desk gave me a run down of the amenities offered by the hotel. 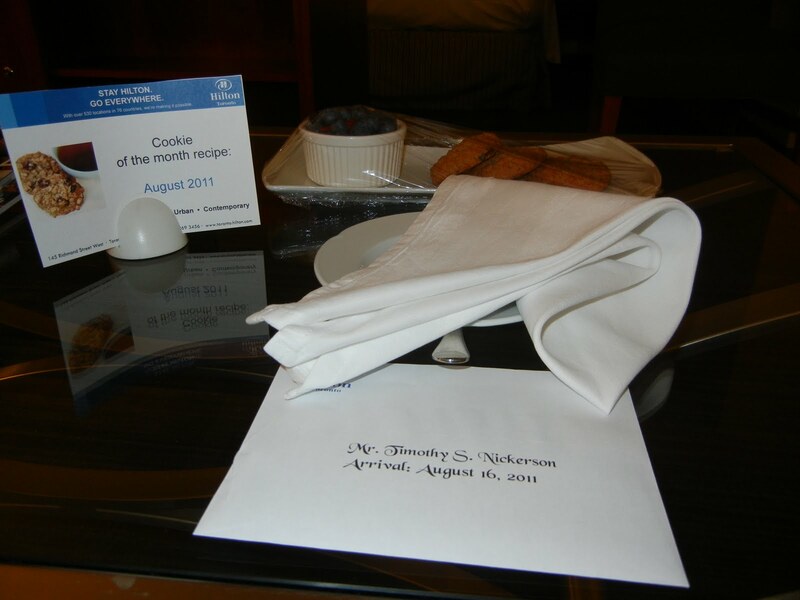 Once I arrived in my room I found a nice note from the Social Media people, along with some cookies and a fruit bowl. The fruit was tasty but the cookies were quite stale. Being a gold member I have access to the Executive Lounge which has limited food/drinks throughout the day. We had breakfast their one morning. My room was a great size for 1 or two people traveling together. It definitely needed a full refresh though. The room seemed to have an overall “dirty” feel, but there wasn’t a single thing that jumped out as dirty in the room. One thing that did concern me was the amount of hair in my room. Short hair, long hair, straight hair, curly hair — it’s like Dr. Seuss hotel review. 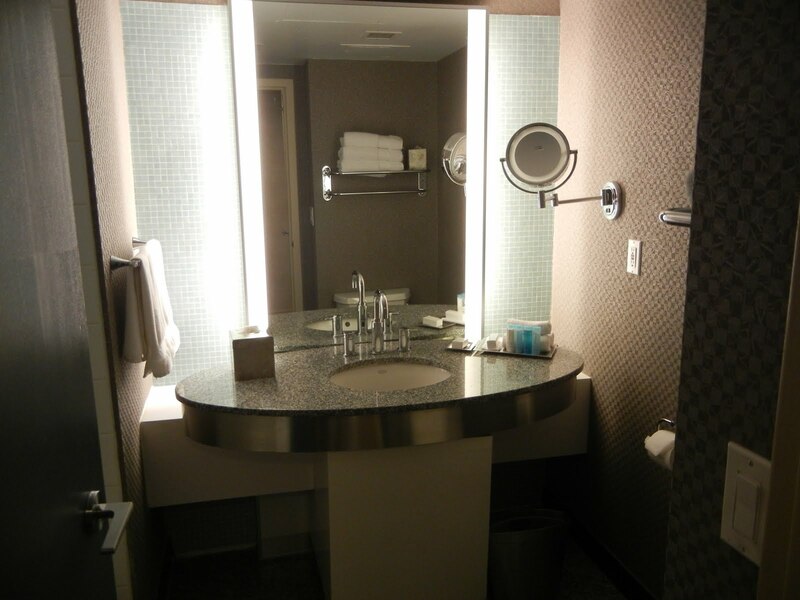 The bathroom as a different story though. 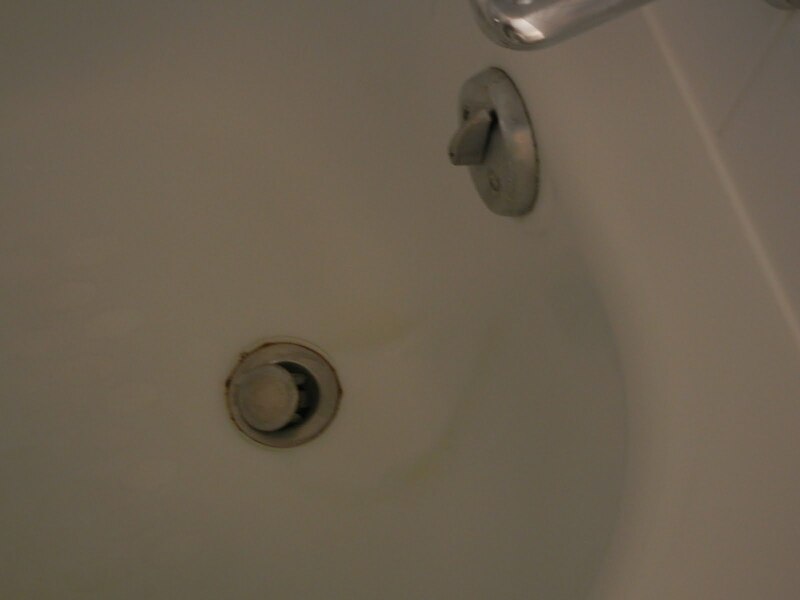 Look at the picture in the tub below – lots of residual stains/dirt. My colleague’s room had a nasty stink in the bathroom. We mentioned this to the Executive Lounge receptionist and she was quick to get the cleaning crew out and offered us a free restaurant breakfast for the following morning. Evidently the bathroom wasn’t dirty, per se, the shower curtain just had a severe mold/mildew issue. After the second time requesting a clean job, they fixed the issue. Now for the food at the Hilton. The bar food was great – some amazing sliders with stone ground mustard and a tomato remoulade. Loved it. We ate breakfast one day at Tundra (gratis because of the stink in my colleague’s room), and well…it was a buffet breakfast at a hotel. If I would have paid the $26C they were charging I would have been very upset. The breakfast was subpar, but we were expecting that. I am not sure if I would stay at this hotel again…the service was really great, but the property itself was a little off. Perhaps the staff was aware of this and were compensating by being very attentive (or perhaps all Hilton’s are that attentive….?). By Tim in Travel on August 20, 2011 .